September 15, 6 – 8pm, Puzzling Night – Calling all jigsaw puzzlers! Help us put together Peacham jigsaw puzzles, all 23 of them! Drop in for a few minutes or the evening. September 18 21, 7:15pm, Readers’ Delight – The group will discuss The Swerve by Stephen Greenblatt. Contact the library if you would like to borrow a copy of the book. September 19, 10am-noon, Coffee Hour – join us for a cup of coffee or tea, a sweet or two and good conversation. Suitable for all ages! September 22, 5:15pm, Friends of Peacham Library — The Friends organize events and fundraisers in support of the library with funds raised used to support book purchases and programs. September 22, 6 – 8pm, Puzzling Night – Calling all jigsaw puzzlers! Help us put together Peacham jigsaw puzzles, all 23 of them! Drop in for a few minutes or the evening. September 22, 6:30pm, Peacham Knitters – Bring your knitting or other handwork for an evening of creativity and chatting. New knitters are welcome to come for help and encouragement. September 26, 9:00 am, Preschool Story Time – stories and crafts for the young and their caregivers. September 26, 10am-noon, Coffee Hour – join us for a cup of coffee or tea, a sweet or two and good conversation. Suitable for all ages! Our puzzles are starting to take shape! We’ve finished one and have two underway. 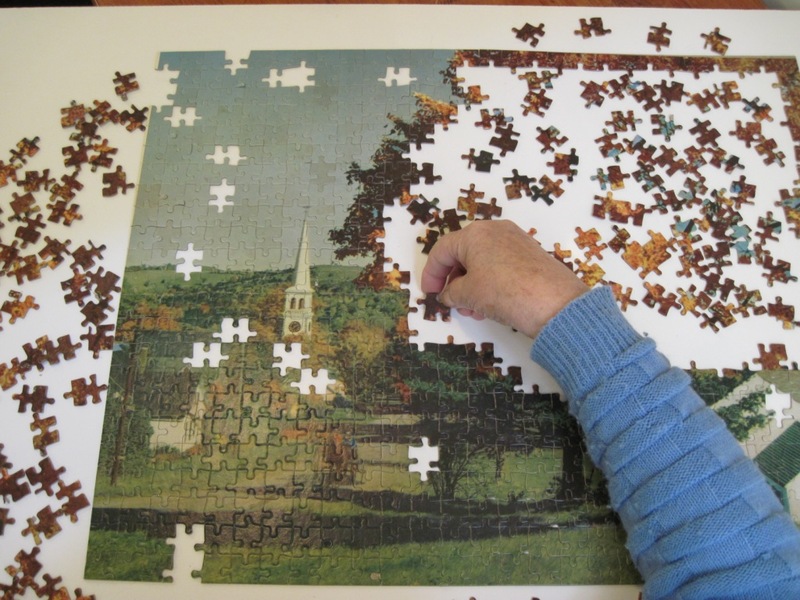 Please drop in on Monday evenings or any time the library is open to work on a puzzle.